MECA Solutions, a premier manufacturer of converting process parts and rolls for printing and other web converting industries, has developed a line of economy custom bridge sleeves that meets the demand for a lightweight, low-cost bridge sleeve option. The basic nature of the designs gives MECA the ability to produce economy custom bridge sleeves on a quick turnaround basis. Printers can order either the economy or premium versions of these in any size and with either the Secondary Air or Flow-Thru air designs. 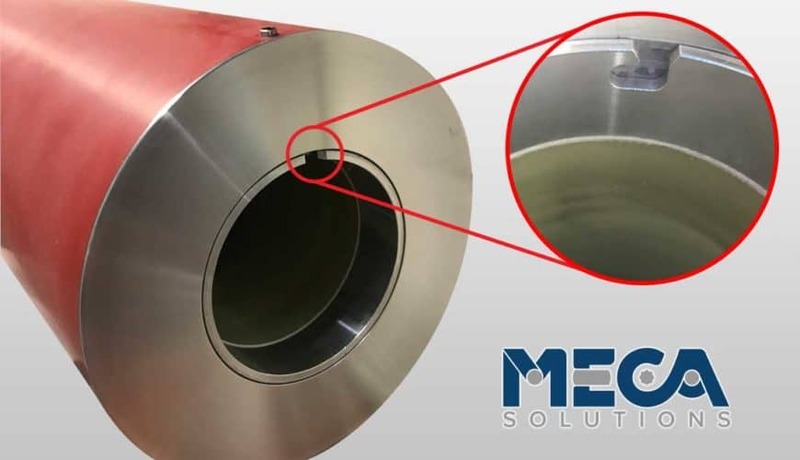 MECA Solutions has earned a reputation as the industry leader in carbon fiber construction excellence, and its new economy custom bridge sleeves also leverage this high-quality technology. Carbon fiber bridge sleeves and mandrels perform exceptionally well at high speeds without forfeiting stiffness at the point of impression. Their lightweight characteristics generate less stress on drive motors to achieve the desired results. Carbon fiber’s molecular structure creates superior strength to weight and stiffness to weight ratios, generating a strong, stable material ideal for applications such as bridge mandrels. MECA Solutions is an innovative engineering provider and manufacturer of flexographic printing sleeves, rubber rolls, custom rolls, tight tolerance machined components, gears, precision rollers, composite plate and bridge sleeves, aluminum and carbon fiber anilox sleeves, and mechanically engraved cylinders for the industrial printing, coating and web converting industries. The company employs more than 60 people at its facility in Green Bay, Wisconsin (USA). For more information about MECA Solutions’ design and manufacturing capabilities, contact Tim Olson, sales manager; Phone 920-336-7382, email: sales@mecagb.com or visit https://www.mecagb.com/.